Here's a short movie -- not by me -- on how to fold a shirt to such a perfect, crisp shape that its very existence provides nearly irrefutable evidence of the presence of a pantheon of benevolent and all-knowing Clothing Gods. I find it compelling. I find it hypnotic. I can't stop watching it, over and over again, hoping to absorb how to perform such household magic. I have taken my shirt off in the kitchen. I have sat, and emulated the master. And I am here to tell you it is not a trick of the light; it is not a special effect; it is not clever editing. It really works. "Start by laying the Tshirt flat and sideways in front of you, neck opening to your right. Find the centerpoint on the far side and pinch it with your left hand, about two inches in from the far edge. Now, while maintaining your grip, cross your right hand over your left, towards the opposite (waist-opening) end of the tshirt. Maintain the same imaginary line you've been working on (about two inches from the far edge of the shirt, parallel to the edge) and add the new edge to the grasp of your right hand. This is where the magic happens. Simply uncross your hands and extend them in front of you, lifting the shirt perpendicular to the floor. 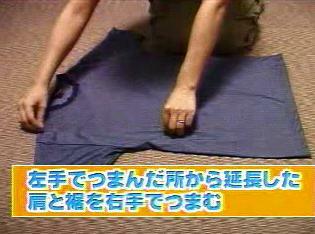 Complete the fold by letting the loose arm hole drop to the floor and folding the shirt in half over it! Breathe deeply and contemplate the terrible beauty you have wrought." OK, that last line wasn't actually part of the voiceover. But it should be. This is a good folding technique and I use it frequently. The main drawback is that the sleeves (particularly long sleeves) tend to flop around as you pull shirts from the stack. This video is a Japanese remake of the original Taiwanese (I think) one that surfaced in 2003. If only they had a magic way to fold fitted sheets. i tried it a while ago. it works. my stack of t-shirts is now half as tall as it used to be.